Scout for a good location when it is still light outside. Compose the photo in daylight, check your basic composition for a story or feeling. This will only make your image more captivating once you get the lights moving through it. I try to get to the location about an hour before it gets dark just to survey the scene and look for traffic patterns. Try to find some back up spots and do the same basic checks. You should scout for a spot where cars are moving through the frame. Remember the basic rules of composition to set up the shot and then imagine the red and white lights sweeping through the image literally painting a trail. Curves, low angles, and wide angles help to accentuate this – the idea is to convey motion. Imagine the end result during the day, grab it when it gets darker! Then wait until dusk settles in. You don't have to wait until it is pitch black to start the process. Often the best results happen about 30 minutes after sunset when the city lights up and shadows become intense but still some light in the sky. What Photography Gear Is Required? You will have to have some type of camera that allows you control over its shutter settings, or better yet, full Manual control. There is some basic gear you will want before you start. A good sturdy tripod will help you to stabilize your camera to prevent any shake during your long exposure. You can always further stabilize the tripod by hanging you camera bag from the center post. A remote shutter release is useful so that when you are ready, the camera's shutter can be tripped without physically touching the camera. After all you want to record the motion of the lights and not the motion of the camera. A lens hood will also help to unwanted light pollution from spoiling the shot. Locking the mirror up and using live view are so suggestions to consider. 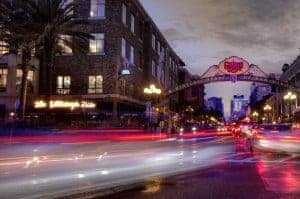 What Are the Ideal Camera Settings for Light Trails? I have found that shutter speeds between 3 and 10 seconds and apertures of f8 to f16 work well. It all depends on the light, speed of the traffic and how close you can get to it. Articles on this website by Jim Harmer describe clearly the steps one needs to take to avoid noise and other artifacts for very long exposures. I like to maximize my depth of field to capture the entire scene – adjust shutter speeds accordingly. I always shoot in RAW, try to keep my ISO low, and always check the white balance with a few test shots. 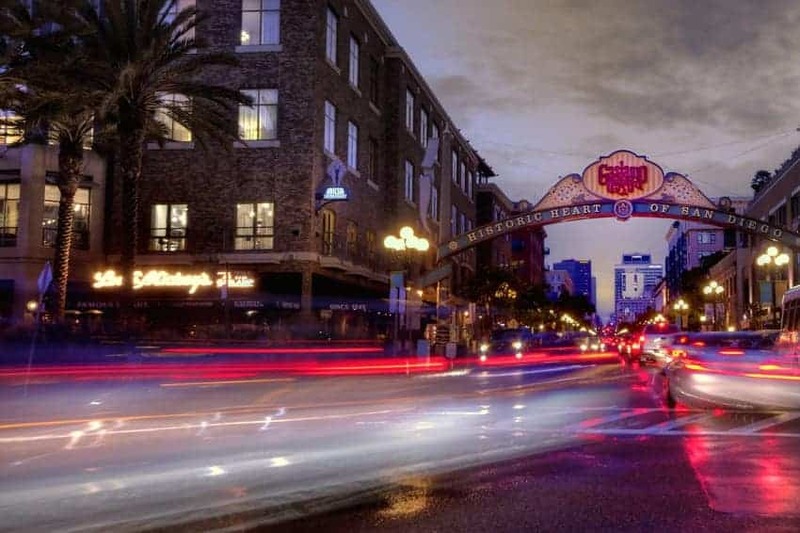 Some urban landscape have a lot of Sodium Vapor lights, like San Diego, to prevent light pollution for local observatories like Mt. Palomar. Others are more Neon like Times Square or Incandescent. 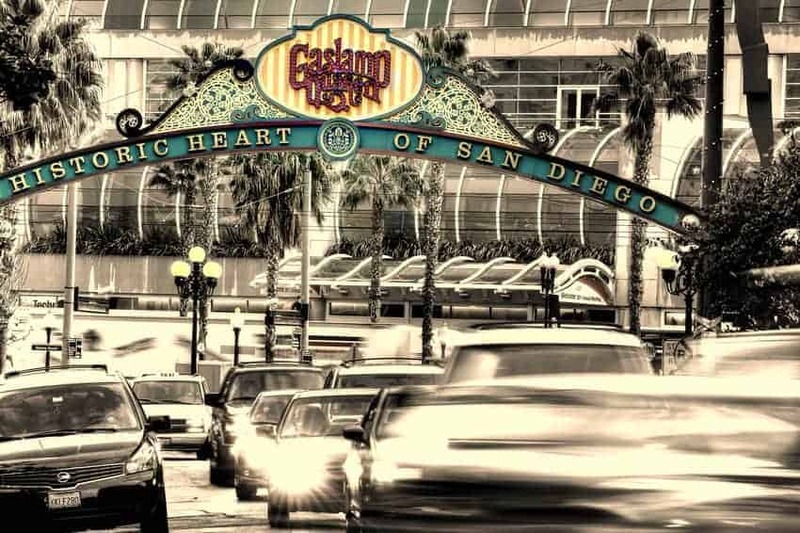 The photo featured at the top of this page was taken in San Diego's Gaslamp Quarter, looking West to the SD Convention Center. What I noticed was that the traffic was at a standstill waiting for the traffic light to turn green. Then as the cars advanced, the lead car would have significantly more speed as it passed relative to the ones that were still waiting to proceed. This gave a what I would call a “gradient of speed” or blur. It may seem like I am in the middle of the road. I carefully chose a safe location behind a parked car where I set up my tripod for the shot. I used a 10-20 mm wide angle zoom to capture the entire scene. The added benefit to the wide angle was that as cars zoomed by me, the wide angle distortion would add additional sense of motion. The motion on the right of the frame is more of the body of the car than a headlight, but still interesting. The next shot is from the another perspective of looking East and Uptown. It was already much darker so the trails became brighter and more pronounced.. This one is even more deceptive as it looks like the traffic is zooming left and right around me. Here I set up the tripod low on a very small traffic island which I found during my initial scouting. I waited until dark, hopped on the island and took several long exposures, the duration of which depended on the quantity of traffic and its speed. I adjusted my aperture to get the exposure correct given a fixed shutter speed – in this case around 5 seconds. Another nice thing to consider is rain, I waited until the streets were soaked before shooting this to get added reflections of the city lights. Motion blur and light trails are not limited to traffic. 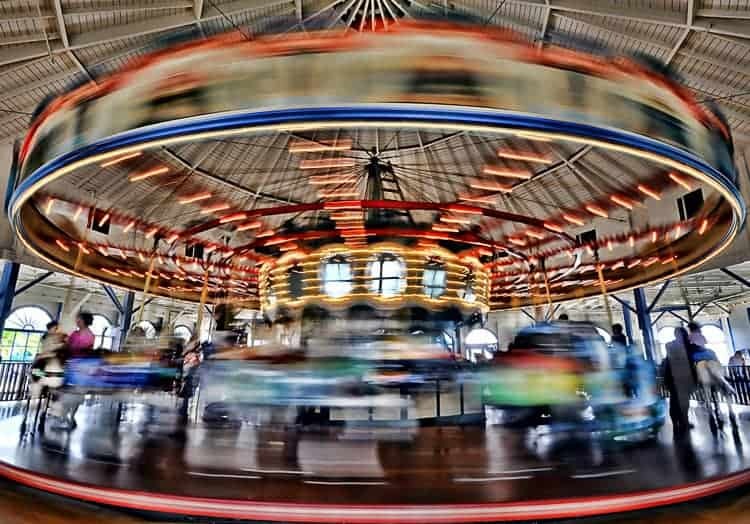 Here is an image of a Vintage Carousel in Santa Monica, California. 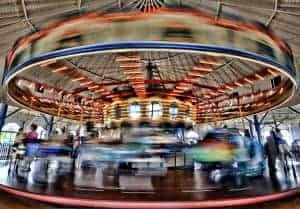 This one was executed by stabilizing the camera on the railing to the carousel, camera on manual, 2 second exposure, f16. So you see, even without a tripod, one can achieve some great results. This was also taken during the day! With a bit of practice and thinking in terms or Motion Blur or Light Trails a new world of imaging will open up to you! Try and try again – preview the images and see the results. If the image is too bright with nice trails, decrease the aperture. If the image have little or no trails, decrease the shutter speed and compensate exposure with your aperture settings. Keep an eye on traffic, sometimes it comes in waves and you'll need to adjust on the fly. Also, a small aperture will give some interesting starring effects for oncoming headlights that may be stationary as in stop and go traffic. Don't be discouraged if your first attempts don't produce the results you envisioned. Take a break and look at your pictures or just try another time (if possible) after thinking through the process a bit longer. I would like to thank Jim Harmer for inviting me to write this article – his Website articles and upcoming book are a superior source for all things Photography! Thanks, jim! 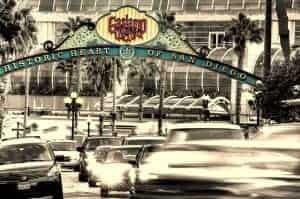 BIO: Erik Kerstenbeck is the Co-Owner of Kerstenbeck Photographic Art, a small outfit operated from San Diego, California. Erik is an Electrical Engineer by trade but has been self studying photography for 30+ years starting with an old Brownie Box Camera. He thrives himself in all aspects of Light, Composition, Technical aspects of equipment and Post Processing Techniques. His newest interest in High Dynamic Range Photography, and Infrared Imaging. He and Kathleen (Wife, Photographer and Partner) travel extensively creating unique Landscape and Urban images, as well as event and environmental and Studio sessions. But most of all they both have a great passion for the photography and have fun on the journey of discovery!